Pile this spicy and sweet slaw on top of a burger, tuck it inside of fish tacos or serve it on the side at your next barbecue. The fresh taste is a welcome change from mayo-laden cole slaws. Even the best burgers and fish tacos need a little extra flavor sometimes. This spicy, tangy and sweet slaw will do the trick, and it comes together in a matter of minutes. Unlike most slaw recipes, there isn't a hint of mayonnaise in this version. Instead, it is dressed with a citrus and hot sauce-based dressing, which also works well when poured over a rice bowl. 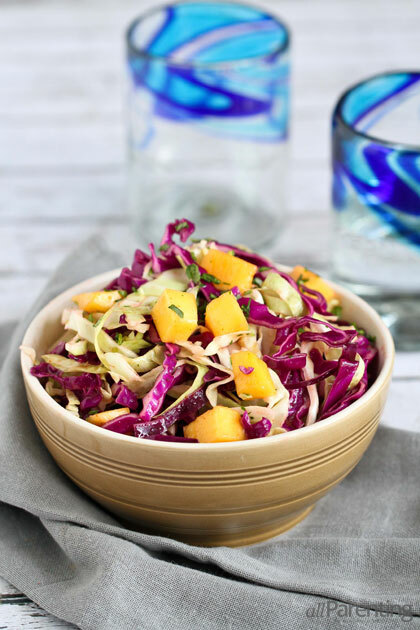 The sweetness in the slaw comes from juicy, diced mango. Mangoes can be a bit baffling to deal with at the best of times, but this post on how to cut a mango might come in handy. Once you get the hang of it, you will want to add mangoes to every salad and smoothie that crosses your path. If your family isn't keen on spicy foods, feel free to cut back on the hot sauce in the dressing. Start with 1 teaspoon and then add a little at a time to suit your taste buds. In a small bowl, whisk together the lime juice, hot sauce, agave or honey, cumin and salt. Gradually whisk in the olive oil. 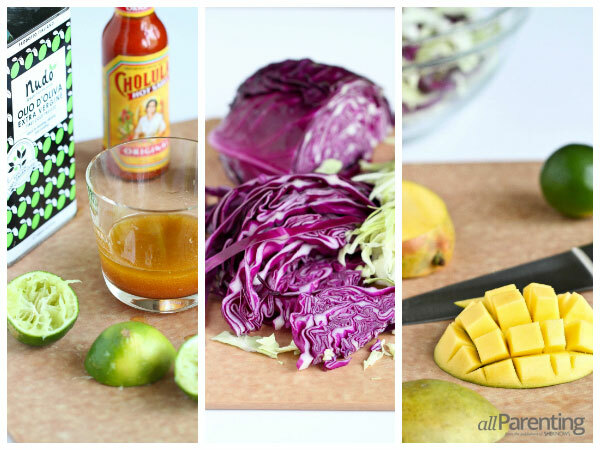 In a medium bowl, combine the green and purple cabbage, mango and cilantro. Pour in the dressing, and toss to combine. Serve.